Walking in the footsteps of Jesus, loving and serving together. Welcome to St Joseph’s Catholic Primary School. St Joseph’s is a happy school with hard working and dedicated staff that are committed to developing each child’s full academic and spiritual potential. We all recognise that our purpose is to provide the very best quality learning experience for each child within a secure and happy environment where mutual respect is paramount. Mrs Ann Wood – Acting Head Teacher. 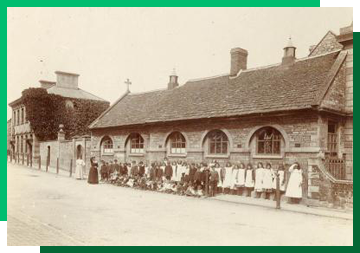 This was first established in two rooms in Cross Hayes House in 1868 and the first school, pictured here, was built in the Cross Hayes in 1869. By 1876 the school was housed in the earlier Catholic church and by 1884 it was being run by the Sisters of St. Joseph of Annecy as St. Joseph’s School. Between 1890 and 1920 the school averaged 60 to 70 pupils, with a new school being built in Holloway in 1932-3 and by 1935 pupil numbers had risen to 90. In 1988 the school had 98 children from Malmesbury, Brinkworth, Hullavington, Crudwell and Sherston and this number increased to 111 in 2000 and is currently around 148.